Warning! Living life to the fullest may involve having the stamina to stand tall, on tip toes, for long enough. Many people do just that. They act on their deep desire to leave virtual life for an existence full of surprises, love, challenges, fears, good things, bad things, ups and downs and other wonderful REAL experiences. Yep, anyone can do it in fact. Even I, who loves lounging around in front of a monitor or TV set with my home made dinner and husband. There is room for everything. Il faut vivre ses reves et non rever sa vie.. live your dream, don’t dream your life. Yes, I’m telling you. You can have your real life and lounge about too. In fact, having a real life makes lounging about that much more enjoyable. That little drawing above here. I made it when I was in the process of climbing the Seven Summits, in the days before online sharing. Reaching for the star I was, just like in the song by my compatriote Jacques Brel. That’s what I grew up with. That’s what inspired me, along with Tintin and Pipi Longstocking. Is it a wonder I love wearing a skirt and pigtails? Is it a wonder I had to find a mountain to better reach for the star? So anyway, I drew it, that reaching for the inaccessible star, a friend stylised it, and I had T-Shirts made to support my take four Everest Attempt, way back in the nineties. Well, that paid for the dried buffalo meat I ate all the way to the summit, so I guess it got me ‘There’. ‘There’, at this moment of here and now, is making Beyond the Smile Documentary. 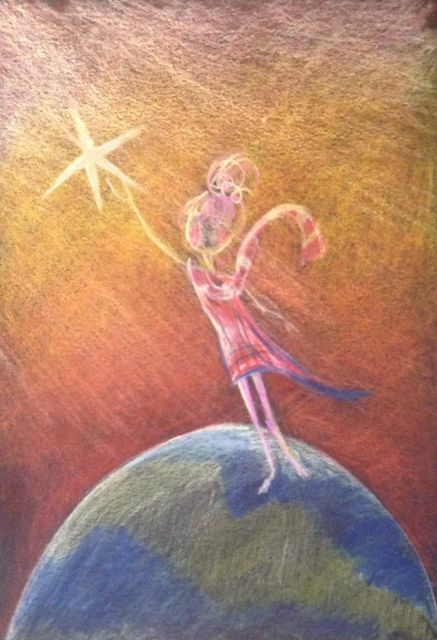 Yes, my Possible Star is making an empowerment program in Nepal go from a two year long literacy course for subsistence farmer women in the small village of Lura, to a sustainable model that can be driven by any place that wants it. To achieve that, we need seed funding. Hence the doco, which tells the story of my involvement with Lura, starting I think, at the top of Everest, touching that star. 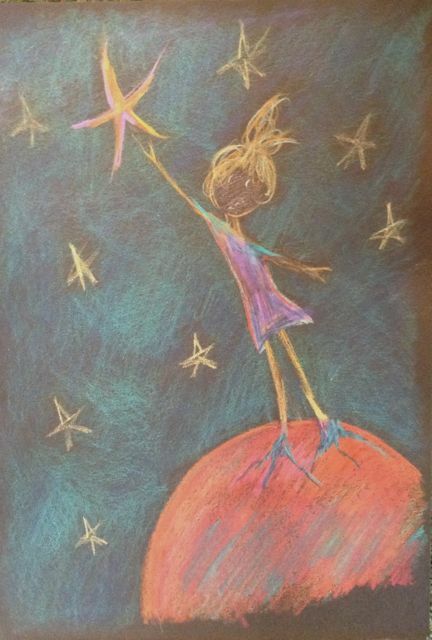 Order your reaching for the star drawing, customised for you or a loved one! PS Off to Lukla and lots of walkies tomorrow, and hopefully, my thumbs are not too big to keep writing on an Iphone! ← Off to the World Expeditions Everest 60th Anniversary Dinner.. in Nepal! This is lovely Brigitte. Are you still doing “reach” T-shirts? Can I get one?